Hope you enjoy this wonderful Paris memory from Guest Blogger Merry MyCue Livingston! Oh, the Eiffel Tower was so impressive! and my gosh, the Arc de Triomphe so huge and imposing, and the Louvre...wow. I had finally arrived in Paris in the Summer of 2009 and I was in AWE. The gorgeous old buildings and museums everywhere you looked were almost too much to visually process. For me, a first-time foreign traveler, this was unbelievably exciting. This native Texan was actually in the most famous city in Europe. PARIS! (not Paris,Texas; there is such a place you know...Northeast of Dallas...not quite the same, however). And while all these spectacular sites will be forever in my memory, there was one very special place I'd like to tell you about. A place a bit far from the heart of the city and not on any tour guide's list. It was in a fourth story apartment located in the 11th arrondissement in the Belleville area. 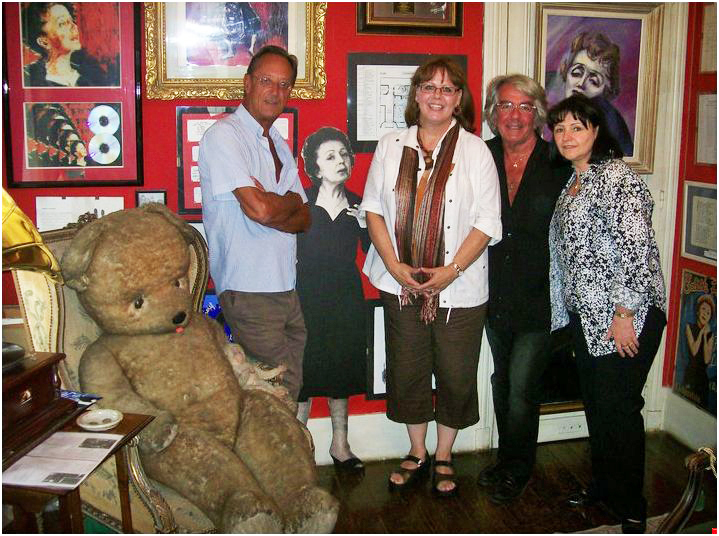 It was a private museum dedicated to Edith Piaf, the legendary French singer who died in 1963. A dear man, Bernard Marchois, lives there and allows others to view the many personal items that once belonged to the famous chanteuse. It is truly his labor of love. He knew Piaf many, many years ago and acquired personal items from family and friends of Piaf, as well as from Piaf herself. Marchois is the secretary general of "Les Amis d' Edith Piaf," and sends monthly newsletters with bits of information, old and new, to members around the world. I was fortunate to go there with a friend who has known Monsieur Marchois for quite some time and I (we) got the royal treatment. My friend, Chantal Calin, is a singer from Belgium who performs a wonderful hommage to Piaf in her concerts. Once inside the two room layout, you will see a tiny black dress that Piaf wore in concerts (she had several identical dresses for her concerts), black shoes, a robe, handwritten notes, many pictures, records, dinnerware, furniture, two stuffed animals given to her by last husband, Theo Sarapo. There are even boxing gloves belonging to her great love, boxer Marcel Cerdan. Piaf music is always playing in the background here. I also recognized a piece of material that was part of a curtain in Piaf's last apartment at 67 Blvd Lannes in Paris. I remember seeing pictures of that apartment with the drapes, and now, I was seeing the actual material. I looked around, trying to take it all in, and got a bit sad. Then I saw that wonderful Piaf smile in a framed picture, and I smiled again. Did I mention I sat on her sofa? And I took some pictures. Mind you this is NOT allowed at the museum, but as I said, I was fortunate to be with a friend and I kind of got away with it. I couldn't help but think of how blessed I was, to be able to see all these wonderful treasures. As I left I also thought of how Piaf gave so much to others by simple singing from her heart...what a gift she had, what a gift she gave. Yes, without a doubt, this "Piaf Tour" was the highlight of my trip. Thanks for the great post Merry! I can listen to Edith all day every day. Such an amazing voice. This is one spot in Paris I have to visit!